Shin Min Daily reported last week about an unauthorised rental of a rental flat in Pandan Gardens. The newspaper reported that 24 tenants were crammed into a single 4-room Housing Development Board (HDB) flat at 403 Pandan Gardens. The illegal activity went unnoticed for four years, thanks to the sly rules instituted by a landlord who illegally sublet his flat to four times the maximum number of tenants HDB allows. Any other forms of subletting of an HDB flat will be considered unauthorised rental. Contravening these rules, one landlord rented his four-room flat out to a whopping 24 individuals and demanded that they adhere to certain strict rules meant to avoid attracting the attention of the authorities. The illegal subletting went on unnoticed for four years. One unnamed tenant told the Shin Min that the landlord imposed strict rules to avoid getting caught. The tenants were barred from answering the door, cooking in the flat, or hanging their clothes outside the unit to dry. The tenants were also told to avoid turning on the lights at night and ensure that the windows are tightly shut. Despite these strict rules, the unauthorised rental of the HDB flat came to light. HDB takes a serious view of any illegal subletting such as the unauthorised rental of the flat in Pandan Gardens. This is because HDB flats are primarily meant for owner-occupation. An owner who tries to circumvent the HDB’s rules by locking up one room and subletting the flat without physically staying in it will be regarded as having engaged in unauthorised rental of the entire flat. Besides routine inspections, HDB also conducts investigations into reports of unauthorised rentals. It further conducts regular checks on flats that have been approved for renting out, to ensure that there are no irregularities such as overcrowding and further unauthorised rental by main tenants. HDB takes a serious view of flat owners who infringe the rental rules, and have imposed financial penalties on errant owners before. In some cases of serious infringement, they have recovered the flats from the owners. “HDB flats are primarily a home to live in, and there are rules in place to guard against misuse. 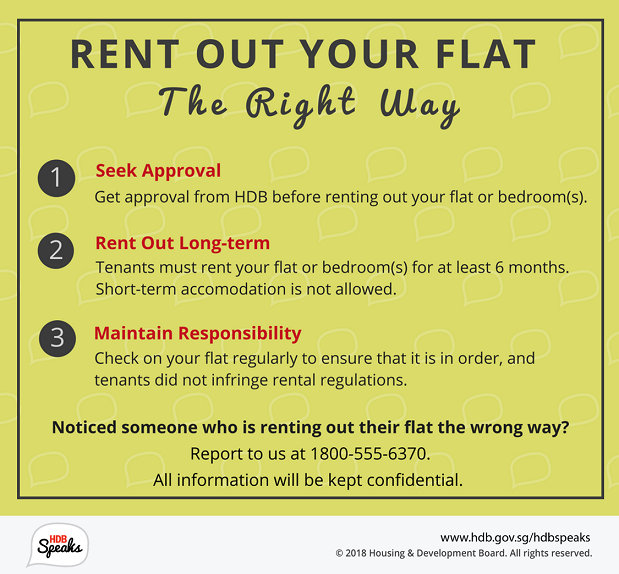 For example, flat owners who wish to rent out their flat or bedrooms must get HDB’s prior approval. A minimum of 6 months’ tenancy is required for both, to ensure that HDB flats are not used as transient accommodation. The rental rules help to ensure a conducive and harmonious living environment for all residents. These are clearly published on the HDB InfoWEB. HDB will also remind flat owners to take heed of the rules when they submit their rental request. The number of flats that are currently being sublet forms only about 5% of the total number of home-ownership flats. This means that the vast majority of our flat buyers do purchase flats for occupation. However, some have abused this policy and its good intentions. There are occasional accounts about how some flat owners are treating their flats as investment vehicles and are renting them out for profit, with no or little intention of occupying them in person within the Minimum Occupation Period. It was reported that in 2013, HDB carried out about 7000 flat inspections and took action against 17 flat owners for unauthorised subletting. This includes imposition of a penalty and repossession of flats.